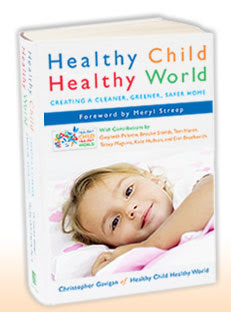 I just started reading Healthy Child Healthy World: Creating a Cleaner, Greener, Safer Home, by Christopher Gavigan. I think it is appropriate since today is Earth Day. It is a very informative book, but it has left me feeling so guilty! It makes me feel like I am slowly poisoning my family, particularly the kids, because of all the toxins that are constantly around us. I had no idea that everything from the crib mattress, to the toys, to the bottles, to the clothing and pretty much anything else that isn't labeled "Organic" or "100% natural" has toxins in it! We've all heard about the toy recalls due to lead paint, most of which came from China. I couldn't believe it when the author recommeded throwing away any toy that came from China and India! The book also talks about the plastic used to make many of the toys. Many of them use PVC (polyvinyl chloride) plastic which actually releases toxic fumes into the air for our children to inhale! Many baby bottles and teething toys are made from this too. Poor Isabelle! Dave and I have been very careful to not warm the baby bottle up in the microwave because this can make it easier to seep in to her formula but I had no idea that it was releasing toxic gases too! The book has many other chapters about making your house, pets, garden, etc. more healthy and less toxic. I haven't read the whole book yet but I am already feeling overwhelmed at how much it would take for me to make a "cleaner, greener, safer home." I can't say that I am going to throw away everything I own that was made in China but I will get rid of some of it and be more selective in the future. I also went to Sprouts today and bought reusable grocery bags, all natural cleaner and laundry detergent and some things to help get the pesticides off of my fruit. It's not much but it does make me feel better that I am trying to make a cleaner, greener, safer home for my family. So I want to know what you are doing or do you think it's just a bunch of you know what! The dogs are no longer with us! They found a better home, or at least someone who wanted them! Sorry for the bad pics but they wouldn't hold still long enough to get a good one! Yesterday Dave was outside around 10:00 a.m. and these two little dogs came trotting up. I thought they were cute so I petted them and went inside to get some water for them leaving the door open behind me. Little did I know that these dogs were going to follow me in the house and now they won't leave!!!!!!! I put posters all around yesterday truly believing that they would be gone by last night but nobody has called yet. This morning Dave let them outside to go to the bathroom and they just ran off like they knew where they were going so we figured they were going home. Ten minutes later what do we hear? Two little dogs scratching on our door wanting to get in! If you know us at all, you know that the last thing we need is two more animals, so please help me find their owner before I go crazy! They are really sweet dogs and great with Robyn, Justin and Isabelle but I just can't handle two more. I can hardly handle the ones we already have! A couple of weeks ago one of my best friends from college came down and we were able to get together for a day. It was so much fun to catch up and reminisce. I love getting together with old friends and feeling like no time has passed! It was especially fun because I got to meet her cute new baby, Mayzie who was born a couple weeks before Isabelle. You can see from the pictures that they couldn't keep their hands off each other. It was so fun to watch them "play" together and of course I can only dream that they will grow up and become great friends, and hopefully roommates at BYU! We had lots of fun visiting my parents for Easter. We went on a beautiful hike, Justin saw his first movie in the theater and actually sat through almost the whole thing, we colored Easter eggs, went to the city Easter egg hunt, and just relaxed. We also had a lot of fun playing the Wii that my parents bought and it was good because we felt like we were exercising too!